Comments: As a general in the Republic Army, Obi-Wan Kenobi leads Clone Army warriors and ARC Troopers in ground battles throughout the galaxy. 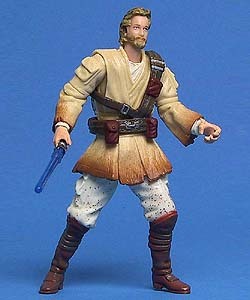 Coming up against the formidable Droid Army, Obi-Wan achieves hard-won victories against enemy forces. On the planet Muunilinst, home of the Intergalactic Banking Clan, he struggles to destroy the Hailfire Droid factories that are supplying the Separatist forces with their military forces. Armed with his lightsaber, survival gear, an array of new weapons and his innate resourcefulness, Obi-Wan attempts to strike a decisive blow against the enemy army. He also encounters a new enemy during the Clone Wars with the appearance of Durge, a bounty hunter on a personal mission to destroy the clones because of their Mandalorian heritage.